In a small pan, add 1/2 cup walnuts and set over medium heat. Stir frequently for 3-5 minutes, until the walnuts are light brown and fragrant. Don't burn them! Nuts are so easy to burn. Set side to cool. In a large bowl or stand mixer, beat the butter until is is soft and creamy. Add the brown sugar and granulated sugar and beat together. Scrape the bottom and sides of the bowl and beat for another 2-3 minutes, until fluffy. Add 2 eggs, 2 teaspoons vanilla, and 1 tablespoon molasses. Beat well until incorporated, scraping the sides and bottom. Add 2 and 1/2 cups flour (spooned and leveled!) but don't mix it in yet. On top of the flour in the bowl, add 1 and 1/2 teaspoons baking soda, 1 teaspoon kosher salt, 1 and 1/2 teaspoons cinnamon, and 1/4 teaspoon nutmeg. Stir it into the flour with a small spoon. Use the beaters to stir the flour into the dough, but not all the way. Stop when the dough is still pretty white from the flour. Scrape down the edges. Add 1 cup quick oats, 1 cup old fashioned oats, and the 1/2 cup of toasted walnuts, if you're using them. Beat just until the flour streaks are gone. Make sure to scrape the sides and bottom of the bowl to make sure it has all been mixed properly, but do not over mix (or you will get tough cookies). Drain the raisins through a strainer. Lay out a paper towel on the counter and pour the raisins on top to dry them out a bit. 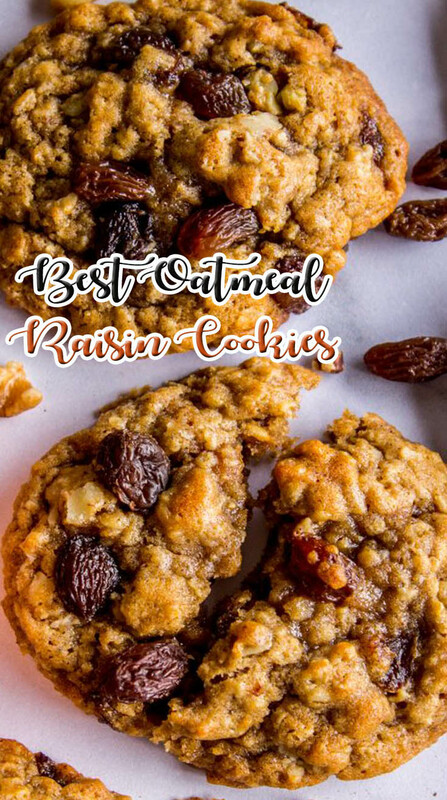 Set aside 1/4 or 1/2 cup raisins to press into the top of the baked cookies, if you want. Use a wooden spoon to stir the raisins into the dough. If they are still a little wet, they may not mix in very well. Just do your best to get them incorporated. Cover the dough and refrigerate for 2 hours or up to 48 hours. If you are in a big hurry, you can shape the dough into balls right away, set them on a plate, cover with plastic wrap, and refrigerate for 30 minutes before baking (they will chill faster if they are already shaped into balls). Line a few baking sheets with silicone baking mats or parchment paper. Use a 2 inch cookie scoop (< this is the one I have) to shape the cookie dough, or just use your hands. Your cookie dough balls should be about 2 inches across, or a little bigger than a golf ball. Place the cookie dough on the prepared baking sheets with about 2 inches in between each cookie. I was able to fit 12 on a half sheet baking pan. Bake at 350 for 11-12 minutes. The cookies should be firm on the edges and slightly golden. They should not be too shiny. A little bit of shine is okay right in the center, but not much. If the whole top of the cookie is still shiny, leave it in for 2-3 more minutes. Remove to a wire rack and let cool completely. But not before eating at least one! Store covered on the counter.